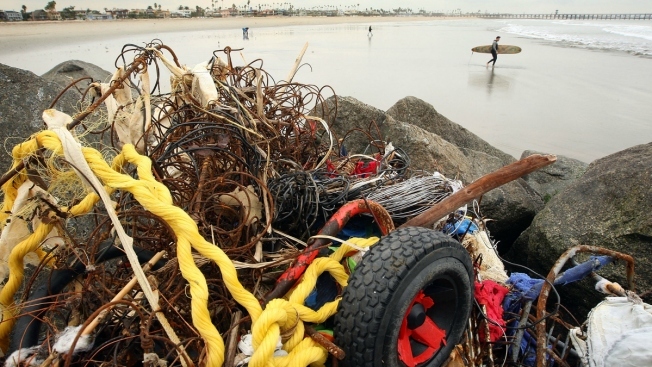 Tens of thousands of Californians are expected to lend a helping hand Saturday at the 33rd annual Coastal Cleanup Day. Hailed as the largest statewide volunteer event, participants will sweep around 2,000 miles of coastal and inland shoreline for trash and other debris. The initiative even won the Guinness Book of World Records' "largest garbage collection" in 1993, according to the National Park Service. This year, there are already 902 cleanup sites set to host volunteers, including hundreds of locations in and around the Bay Area. For a complete list of places to volunteer Saturday, visit the California Coastal Cleanup Day web page. EAST BAY: Don Edwards San Francisco Bay National Wildlife Refuge, 1 Marshlands Rd., Fremont, Register at (510) 792-0222, ext. 362 or 361; Alameda Community Sailing Center, 2532 Santa Clara Ave, Alameda, Register at (510) 629-9282; Martinez Regional Shoreline, Ferry Street, Martinez, Register onsite or online. PENINSULA: Linda Mar State Beach, Register by email at jimfithian1234@yahoo.com or anamag123@gmail.com; Marina Lagoon 3, Virgo Lane, Foster City, and Pescadero State Beach, 18253 Cabrillo Hwy, Register online; Adobe Creek, East Bayshore at Adobe, Palo Alto, Register at joanna.tran@cityofpaloalto.org. NORTH BAY: Point Reyes National Seashore, Drake’s Beach, Register by email at gregory_purifoy@nps.gov or online; Bodega Head, located at tip of Bodega Bay, Register at (707) 829-6689 or by email at jo@coastwalk.org; Hamilton Wetlands, Parking lot off Hanger Ave., Novato, Register at 510-715-412 or by email at 1plantminded1@gmail.com. SAN FRANCISCO: Lands End Cleanup, 680 Point Lobos Ave., Register online; Ocean Beach Cleanup, various locations, Candlestick Park: Jackrabbit, Register at 415-831-6333 or by email at jadd.correia@sfgov.org; Crissy Field & Presidio Cleanup, Stilwell Hall, Old Mason Street, Register at (415) 561-3077 or by email at volunteer@parksconservancy.org. SOUTH BAY: Guadalupe Slough, Sunnyvale West Channel near Borregas or Java, Register at jdavison@sunnyvale.ca.gov; Uvas Creek, located in Christmas Hill Park, 7050 Miller Ave., Gilroy, Register by email at Susan.Voss@ci.gilroy.ca.us; Berryessa and Tularcitos Creeks, located behind Milpitas Town Center, Register by email at lesliestobbe@ci.milpitas.ca.gov.